Rome tours can be confusing to decide on, but this is the best way to see the Eternal City's highlights, a must for first time trips to Rome. 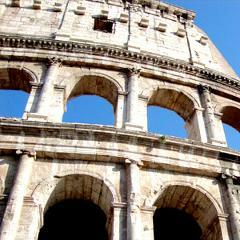 Take our Rome walking tour of the city's most popular monuments and bustling piazzas in the historical center. You will enjoy the highlights of Rome attractions with over 2000 years of history coming to life! 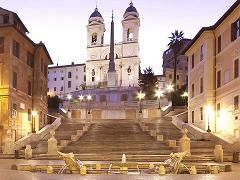 Your enjoyment of Rome’s treasures will certainly be enhanced by your knowledgeable and passionate guide. You will experience real Roman folklore as well as travel back in time and learn old traditions and customs. Your expert guide will not only help you navigate Rome’s charming streets, but also help you uncover Rome’s secrets – from past to present. Another benefit of having a true local as your private tour guide is that you wont need to think of things to do in Rome - know where to shop, where to eat, and get ideas of what to do in your spare time in Rome from your guide. If you are tired from a long flight, why not upgrade your walking tour to an Electric Golf Cart Tour! Everyone who comes to Rome must visit the Spanish Steps - the "5th Avenue" of Rome - where all the world's top designers have set up shop. Take in the magnificent view of Rome from the top of the steps, then stroll down Via Condotti, at the base of the Spanish steps, which is one of the most famous places to shop in the world. All while learning the Spanish Steps history. 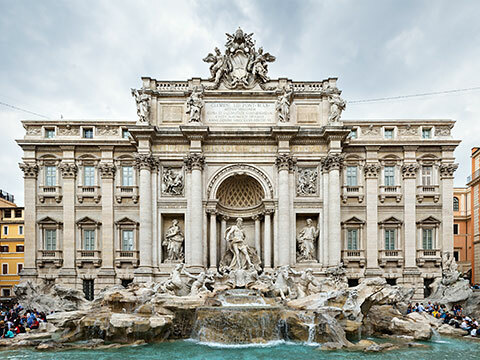 You won't need to ask yourself " where is the Trevi Fountain " as you'll be expertly navigated through the city streets. 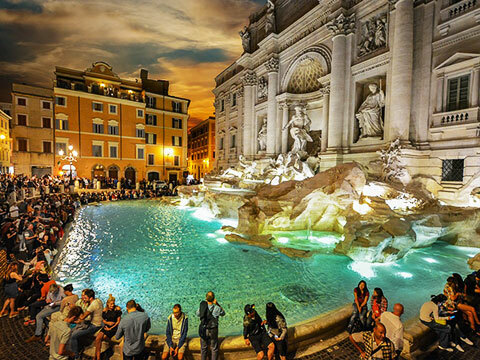 You’ll want to toss a coin into Trevi Fountain, the largest and most famous fountain in Italy (seen in Fellini's La Dolce Vita movie), ensuring that you will one day return to Rome. Learn the secrets that the fountain holds. 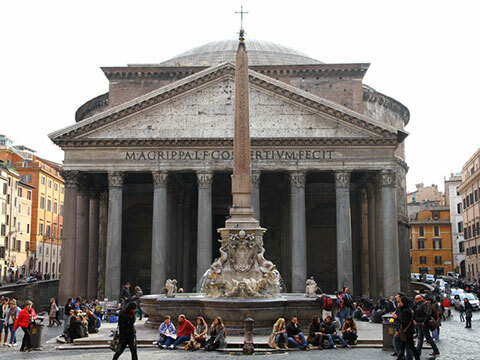 Continue walking among the city’s wonders, and explore the Pantheon - This magnificent building is considered the most well-preserved ancient temple in the world and the most amazing architectural structure of the ancient world. Michelangelo was so impressed with the Pantheon that when he saw it for the first time, he proclaimed it of "angelic and not of human design"
You’ll stroll through the bustling Piazza Navona, named the most beautiful square in Italy, which houses three magnificent fountains including the famous Fontana dei Quattro Fiumi (Fountain of the Four Rivers) by Bernini. 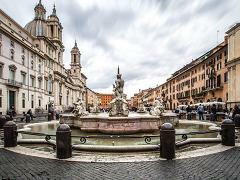 Piazza Navona is also one of the liveliest squares of Rome with several quaint outdoor restaurants and cafes. If you are up for more touring, we highly suggest pairing this tour with a Colosseum Tour, or following our special 2019 Première Early Morning PRIME Vatican Tour! 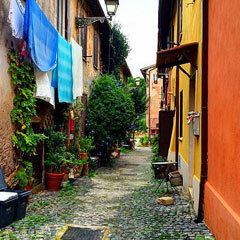 Lose yourself in Trastevere’s charming streets and lively piazzas. You’ll immediately see why this unique neighborhood is a favorite for visitors and locals alike. You'll find many bars and restaurants nestled in the curving alleys - a great place to end your day of tours and have a bite to eat! An extra fee will apply if transportation is requested. Book your tour and create your personal walking experience by making it a full day, adding 3 extra hours! You can tell us in advance your favorite sites to visit or your personal guide will make suggestions based on your interests and energy level - you set the pace and see what you want to see. Please make a note on your booking if you have specific requests so we can ensure that reservations are made when needed. An extra fee will apply if transportation is requested. US$140** Please note: Entrance to the site is optional - Admission tickets will be charged separately. No time to do a full Colosseum tour? Make it quick! Marvel at this epic engineering feat of the ancient Romans, one of the most amazing attractions of the Ancient World, and a highlight of any trip to Rome. Your guide will bring to life the stories of this iconic monument, its famed gladiators and the emperors who made it all happen. An extra fee will apply if transportation is requested. US$140** Please note: Admission tickets are not included and will be purchased on site. The quiet tunnels will come to life as your guide tells you the stories and legends of early Christianity during the days of Roman persecution. The catacombs were the underground burial places of the early Christian and Jewish communities. You will discover the secrets of Christianity's earliest proponents who helped Christianity survive during the persecution from Rome's pagan emperors. An extra fee will apply if transportation is requested. Reveal the ancient secrets you won’t find at the Forum with this extension! Walk through the Teatro Marcello, conceived by Caesar and built by Augustus, which certainly served as the blue-print for the later and more famous Colosseum. Then visit the Jewish Ghetto and end in the Area Sacra of Largo Argentina where you will learn about Julius Caesar's dramatic final moments. An extra fee will apply if transportation is requested. US$265** Please note: Price is up to 4 people. For bigger groups please send us an email. Accompanied by your private guide, head to a historical trattoria in Rome and meet the chef, who will teach you the main techniques to bake a pizza according to the traditional Italian recipe. Season your own pizza with delicious, fresh ingredients and put it in a wood-fired oven for a perfect cooking. Enjoy the pizza you’ve prepared with your family and friends, accompanied by a soft drink. US$350** Please note: Price is up to 4 people. For bigger groups please send us an email. Reach a typical roman "gelateria", an artisanal workshop that has recently been renovated. Engage in a funny, entertaining activity and learn how italian people prepare the famous gelato. Make your own ice cream following the traditional Italian techniques and recipes and enjoy it! An extra fee will apply if transportation is requested. US$430** Please note: Price is for transport up to 4 people. For bigger groups please send us an email. Discover a new way to tour historical Rome. Make yourself comfortable while your private driver and guide accompany you during this 3 hour tour. Set off and admire the most significant sights of the Eternal City. Listen to your guide, who will be your story-teller during this tour to discover the major fountains and squares of Rome. US$120** Please note: Experience is intended for up to 6 people. For bigger groups please send us an email. In the picturesque atmosphere of Via dei Coronari, street of the antiques, you will take part in the workshop of an Italian artist. 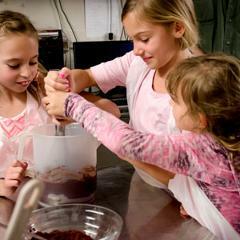 This activity is fun for the whole family!. You will learn how to make a fresco or a mosaic. Choose a subject, prepare the surface with the plaster, the drawing, and you will use your brush to give life to the images; or make your own mosaic with a natural glue (water and flour) and fasten the marble or the glass pieces (tesserae) on a wooden support, creating your small masterpiece. Take home your creation to make your Roman holidays even more memorable! US$70** Please note: Admission tickets are not included and will be purchased on site. The Capuchin Crypt is a small space comprising several tiny chapels located beneath the church of Santa Maria della Concezione dei Cappuccini on Via Veneto near Piazza Barberini. 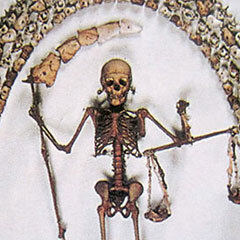 You'll be amazed by the strangely decorated Capuchin Chapel - which displays the bones of over 4,000 Capuchin monks! The Capuchin order insists that the display is not meant to be creepy, but instead, a silent reminder of the swift passage of life on Earth and our own mortality. An extra fee will apply if transportation is requested. Hi Eyes Of Rome. Can you explain the difference between the Early Bird tour and the Art & Breakfast tour? 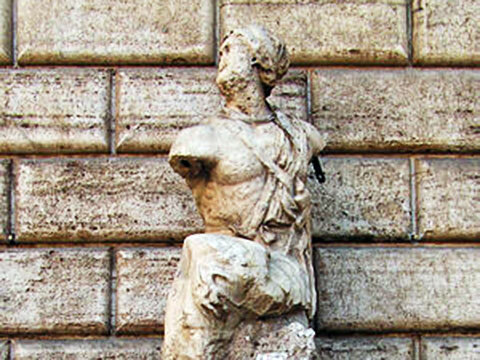 Rome has a vast historical center, but walkable and always surprising. You will never see it all in a day, never in a lifetime. So take the time you have to enjoy its eternal beauty at your best. You will love it in any case! walking tour in rome, loved it! I have been on a walking tour of rome a few days ago with eyes of rome with my friend and we loved it! September is a great time to travel in Rome, weather still very nice and not many tourists around.Rome is a such an beautiful and interesting place, everything has a story to tell, fountains, streets, the number of churches that are along the way, and out guide was brilliant. Silvia the guide also suggested a nice restaurant where to have dinner and where to find good gelato! Definitely recommended to have a guided tour in Rome. Next time we come toRome we definitely want book a food & wine tour! City Walking Tour = Amazing! I loved this simple and beautiful tour through the ancient city center. It's remarkable the amount of world-famous and world-class art, out in the open, free of charge and no tickets needed that you can find in Rome. Having a guide to point out the things you may have missed along the way, as well as the stories behind these great monuments and the great people behind them was indispensable. 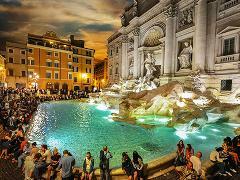 I do recommend this tour, and be sure to throw a coin in Trevi Fountain so you'll come back to Rome! I loved the City Walking Tour. I had no idea that almost all the most famous spots in Rome were so close, and our guide Azzurra was great. She knew absolutely everything- even when we tried to stump her, she had an answer. Anyways, after this tour, together with the Vatican and Colosseum, you'll have seen most of what people come to Rome to see, and can cross Rome off your bucket list! Good question! You are right that the stops on the City Walking Tour (also called the 'Rome by Night Tour' after dark) are all pretty close to one another, and can be visited on your own in a couple of hours or less, depending on your speed. However, speed is not necessarily the best way to take in the sites of Rome. One of our mottos here at Eyes of Rome is 'Looking is not Seeing' and I wholeheartedly agree- there is a lot behind everything in Rome, and these world-famous stops are no exception. 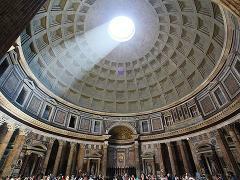 Starting with the great Pantheon- Rome's oldest surviving place of worship, you'll learn about its construction, its famed dome which was thought impossible to construct at the time, and how and why the great painter Raphael came to be entombed there. Sure, the Pantheon is stunning on the surface, but a private guide to bring the past alive and tell its stories are really what makes touring with a private guide a good investment! On this tour you'll also visit Trevi Fountain, Piazza Navona, and the Spanish Steps...all with amazing histories and secrets to discover. Also on a private tour you can spend more time at the sites you want (or haven't yet seen) and less time at the sites you are less interested in- everything is totally customizable either beforehand while making your booking, or at the start of your tour with your guide. Thanks again for your question! Either way, Rome remains amazing and of course we'd love to have you on a tour! Ciao! I am interested in your Private City Walking Tour; I'd like to add Trastevere and the Jewish district but my dad walks with a cane and I'm not sure a 4h walking tour would be feasible....Can we include those areas and shorten the standard itinerary? This is Stefania writing, I am one of the tour guides here at Eyes of Rome! You know, one of my favourite tours is the City Walking Tour! I love to show my guests around my city and, among the best sites to visit, I definitely recommend the Jewish district and Trastevere! There are many stories about the Roman Tradition to tell.....I usually arrange this tour in the afternoon so that, at the end of the visit, I can recommend you a couple of genuine roman restaurants where to have dinner! Regarding your dad, don't worry! Having a private tour allows you to keep your own pace and choose the itinerary that suits your needs the most! I wait for your email then :) Please write us at info@eyesofrome.com if more info are needed! A presto! Hi, I have a question: does the "One Extra Hour" extension mean that the guide will slow down the regular tour or it rather means that you can choose to visit some Site else? Good question :) Both options are actually correct: whether you think you need an extra hour to slow down and take it easy, or if you want to add a place of interest to your itinerary! If you already have something on your mind please contact us at info@eyesofrome.com and we will be happy to discuss it together! Tour Time: Approximately 3 hours. Adding optional sites will extend your tour time. Tour Start Time: You can select your favorite starting time. We recommend 09:30AM or 3:00PM. Tickets: Admission tickets are not needed. Children Tour for Free: Children aged 17 and under tour free with paying parents. Dress Code: Modest attire is required to enter churches.